Appleton Screen Doors Designed to Exceed Your Expectations! Properly designed screen doors allow you to enjoy the fresh air while keeping the bugs outside where they belong! That is what most people expect from the product they choose but the fact is most screen doors don’t live up to those simple expectations. So whether you are looking for a front screen door to add curb appeal or one for a screened patio, the right choice can provide years of trouble-free use with minimal maintenance. 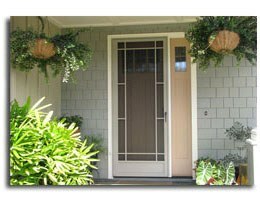 How to Choose the Best Screen Door for your Front Door or Screen Patio. Many people chose a wood or vinyl screen door simply because they are readily available in the big box home improvement stores. Are they the best choice for you home and lifestyle? Are Wood Screen Doors the Right Choice for Your Screened Patio? Many purchase wood screen doors for the natural feel or the nostalgic squeak of the hinges. They are a common choice for older homes or ones that have wood siding. 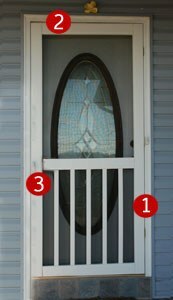 What are the drawbacks of a wood screen door? Wood rots if not properly maintained (fig 3) which requires upkeep on a regular basis. They tend to twist resulting in gaps that can let the insects in (fig 2). Even with an unsightly tension cable in place (fig 1) they sag over time and are often out of square. The screen is stapled in and held in place with wood trim so it does not stay tight and is hard to repair. 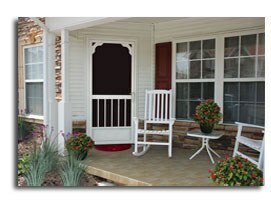 Overall, a wood screen door can start out looking beautiful but in a short time it can become a maintenance nightmare. Will Vinyl Screen Doors Hold Up to Everyday Use? Vinyl screen doors are another option you may find at your local hardware store. They are more popular because they don’t require painting or staining. Some people believe they are more durable and require less maintenance than wood but looks can be deceiving. The vinyl screen door on the right is a perfect example; from a distance it looks pretty good. But upon closer inspection, the common issues come into focus. They may not rot but they do flex and warp (fig 2). 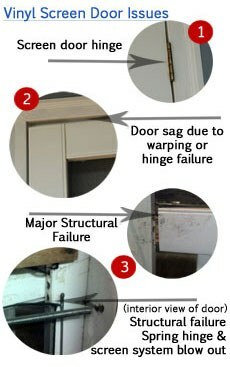 Most are installed with inferior hinges which don’t hold the door in place causing sagging (fig 1) over time. 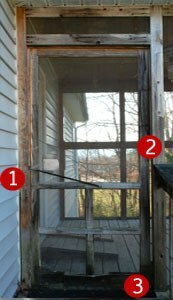 Daily use will take a toll on any screen door and because vinyl flexes, the structural integrity of the frame can give way quickly (fig 3). 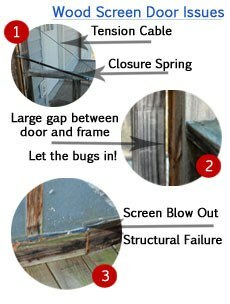 Although the screen is easier to repair over a wood door, it uses a round spline which “rolls” out with minimal effort requiring yet another costly repair. Color options are limited since most vinyl screen doors are only available in white. Are you a considering installing a Storm Door on your home instead of a screen door? Frustrated by the lack of quality and options? Many consumers end up buying a storm door which doesn’t offer the same ventilation as a screen door which can void the warranty of their front entry door. Storm doors do not complement a screen patio. But home owners often choose to sacrifice aesthetics and ventilation just to get something that holds up better. Don’t settle. There is now a much better option available for your home! Avoid the pitfalls and frustration of not choosing wisely for your home. Read 1st hand experience from a homeowner here. PCA manufactures a full line of attractive handcrafted aluminum screen doors right here in the USA that are built to last. 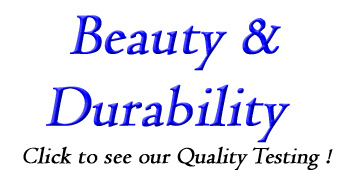 Many manufacturers say their products will “hold up” or are “heavy duty” but only PCA has the design to prove it. Our aluminum frame with incorporated corner keys can hold over 700lbs without bending, twisting or warping. The screen system utilizes a self-locking spline technology that has been tested to hold over 500lbs! PCA’s powder coated finish exceeds 2500 hours of salt spray testing which provides a truly maintenance-free finish even in the high salt coastal areas. Available in white, bronze, ivory, sandstone or clay, with a PCA screen door you have choices to match or complement the finish of your home. The quality does not stop with the screen door. Our standard hardware package includes wool piled lined Z-bar that installs around your existing opening and provides a quiet close and tight seal. The Bug Sweep is adjustable for those uneven floors and features a commercial grade wool pile that does not wear out like rubber or vinyl. Bugs don’t stand a chance! A Continuous Piano Hinge runs from the top of the door to the bottom eliminating door sag. Are you working with an out of square opening? That is not an issue because PCA’s installation hardware is fully adjustable in the width and height. 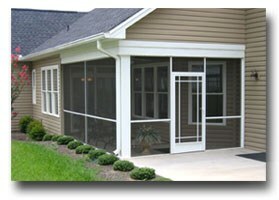 With PCA’s universal installation kit our screen doors can be hung right or left and can be in-swing or out-swing. The rust-free screen door handle is easy on the hands with its comfortable pull style action (ADA approved door handle). A pneumatic closure tube is also included with PCA’s standard hardware kit. 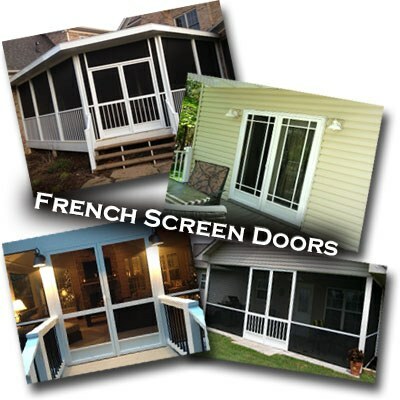 Have you tried to Find Double Screen Doors for French Door Applications? The exclusive PCA Astragal System contains dual flush bolts at the top and the bottom that are easy to operate, and provide a quick and effective way to open and close your "fixed" screen door. The entire PCA French Sceen Door System is made of all RUST FREE components! You can rest assured your French Screen Doors for double doors will last for years to come. Don’t settle for the inferior quality and limited selection of other Screen Door Manufacturers. 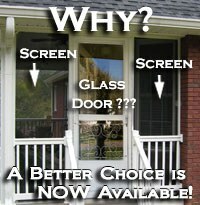 Demand a screen door that is designed for everyday use! Demand PCA! Stop by or contact your local specialty home improvement center or lumber yard to see firsthand PCA’s line of aluminum screen doors. Or if you prefer, fill out the form above and we will be happy to put you in touch with your closest retailer. 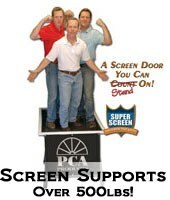 PCA Handcrafted Aluminum Screen Doors Manufactured in the USA! 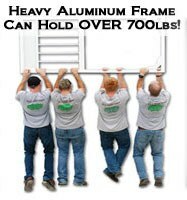 Let PCA Screen Door Company supply you with the heavy duty aluminum screen doors you have been looking for in Appleton WI. 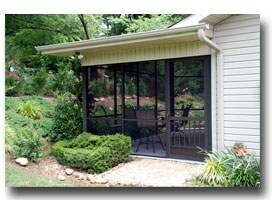 Why install a storm door on a screened patio? 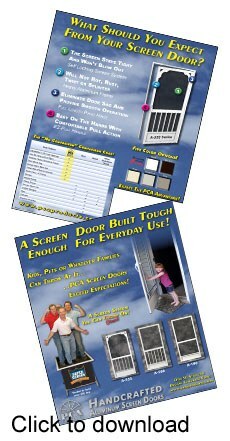 PCA Aluminum Screen Doors – Features that Deliver!